A state senator from Boone today officially declared himself a candidate for the Republican Party’s 2010 gubernatorial nomination. Jerry Behn has been among a group of six men who’ve been appearing this summer at candidate forums and today Behn arranged a series of media interviews at the statehouse to formally kick-off his campaign. "Really, I think this whole thing is about jobs and job creation and what are the issues that can foster jobs and job creation," Behn said during an interview with Radio Iowa. Education is an important foundation for the state’s economy according to Behn and he advocates a return to teaching the basics in elementary school, as well as giving parents an annual $5500 "scholarship" so they may enroll their child in the private or public school of their choice. "That would be my preference, to some kind of a scholarship where the money follows the student," Behn said. "…If you can get it done for less than $5500, you could leave that money in your scholarship and it would be available to you to go to college when you graduate from (high) school, so there would also be an incentive to get the best deal that you can." Behn’s three oldest children attended public schools. His youngest, a daughter, is enrolled at a Catholic school in Boone. If elected governor, Behn said his highest priority would be finding ways to stop the "brain drain" which sees Iowa-educated students taking jobs in other states. Behn argues the recent Iowa Supreme Court ruling which legalized gay marriage harms job creation efforts in the state. "I see an activist Supreme Court that waded into an issue that wasn’t theirs as detrimental to job creation because businesses won’t know what the court is all about," Behn said. "If you read that ruling, you’ll see that they kind of jumped around, talked about certain times under certain criteria they use this standard, at other times they use another standard." 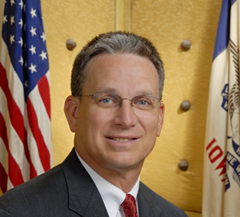 Behn, in his fourth term in the Iowa Senate, sees fiscal issues as Democrat Governor Chet Culver’s greatest liability. Behn has been among those calling for a special legislative session this summer to cut the state budget. "Taxes are a big thing and balancing the budget is a big thing," Behn said. "And I would very frankly say that’s where the governor has shown his lack of ability to balance the budget very frankly." Iowa Democratic Party chairman Michael Kiernan issued a prepared statement via email, labeling Behn a Republican "naysayer." "He’s apparently proud of his record of ‘no,’ because he’s saying more of the same as he launches a statewide campaign," Kiernan said. "He’s got a rude awakening ahead of him, though, when Iowans find out he has no new ideas, no plan for recovery, no support for economic stimulus and no idea how to lead this state.